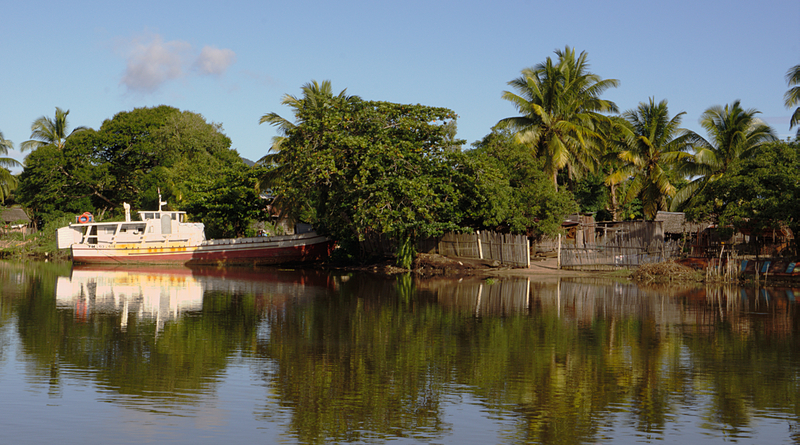 Maroantsetra is a one dirt road town built on a river, a bay and the sea. Essentially isolated by land – the roads are no longer passable – most of the trade is by sea. The boats from out of here regularly sink, taking the occupants. The captains, I am told, are unreliable to a man, and will tell you they are sailing tomorrow when they in fact they might be sailing in 6 weeks. Picture: These boats sometimes sink, sometimes it seems without even making it out of port. Maroantsetra stands at the top of the Masoala Peninsula, the wettest place in Madagascar (approximately 9 times wetter than London) and one of the most isolated. This wetness and isolation make it make it one of Madagascar’s most ecologically diverse regions, both in terms of biology and human behavior. It also means one’s underwear is constantly wet. While now it mostly makes its living from fishing and the sea trade, in times past Maroantsetra and the adjacent Masoala Peninsula was one of the world’s major pirate enclaves, with some pirates having upwards of 50 wives. This caught my attention as I had not realized piracy was so profitable. Even so, while the local women do have a certain charm, I would not want to marry 50 of them, no matter how much I enjoyed my piracy. The only ‘supermarket’ is a concrete shop with roughly 1/3 of its aisle space devoted to hard liquor, mostly local rums of varying degrees of toxicity, and names like Kazanova, Gard Hot and Nigrita. It is opposite the river and in fact it is the kind of ‘supermarket’ you would expect in a (former) pirate enclave. However I was later also told that the rums in the ‘supermarket’ were not drunk by the sailors, who in fact drink more downmarket (and more toxic) rums, but by the towns wealthier gangsters. At first sight this does not seem like the kind of place (being one dirt road and all) that would merit let alone support rum drinking gangsters. But I suppose where you have sea trade, you have gangsters. The other sign of Maroantsetra’s trading origins is its Muslim traders. They are distinctive, mostly with beards and round hats, and have shops selling goods mostly from India and now China. It was these quiet gentlemen who while Europe was still wrestling with plague, starvation and grinding feudalism, brought mathematics and a gentler form of Islam to Africa and Asia, as far as Malaysia and Indonesia. Of course, for all their culture and enlightenment, a quick visit to one of their shops will quickly teach you that they are not averse to the odd sharp business practice. This very narrow bridge connects Maroantsetra with whatever little it is connected to, and sees constant traffic of people (you can see them through the bars) with baskets on their heads, people in their church best, kids in their first communion dress and legless beggars walking themselves across with their hands.